This is a fun review, and it sounds like it might be a fun read (I can forgive shallow characterization in crime thrillers... ;-) ). I might look out for the print version of this some time. That sounded really interesting, up until your comments on the gender politics & representation of female characters - getting bothered about that sort of thing really isn't just for female SF readers! @S: that was kind of the point I was trying to make--saying that there are sexist elements to the book and then saying that women SF readers therefore wouldn't enjoy it was problematic to me. You've expressed why better than I did. Johann, I didn't actually mention it - here, or on the TimeSplash blog - but another puzzling aspect of the review is that Keith picked Jay as the protagonist. While he is a significant character, I consider Sandra the main protagonist of the story - not a supporting role at all. If anything, Jay plays support to her lead most of the time. She is the prime mover of the plot, she drives the action (particularly in the second half), and she most definitely has more at stake than any other character (except mabe Sniper, the villain.) Compared to Sandra, Jay is a rather simple soul. As I say elsewhere, this has been an educational review for me. @S: Well, quite - after all, I was slightly bothered by it. But I do think it's fair to say that if you are in the gender in question there's something a bit more personal in this sort of thing. @Johann: I agree, it would be too much to say that all (or even the majority of) women SF readers would be put off by the elements that bothered me. Indeed, it would be quite contrary to fact, since the reviews page for TimeSplash includes glowing reviews from at least four women. But my female SF-reading acquaintances I do know, and I think that they might also be bothered. @Graham: Good work - campaigning for women's rights for 40 years is quite a track record! @graywave: Also: as for your last point, I'm as interested about that as you are! 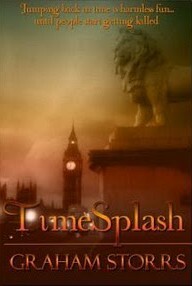 I certainly felt that Jay was the central character in TimeSplash, and this morning I ran through the book quickly to see what gave me that impression. I would say that first four chapters are Sandra's, but Jay has more page time than Sandra in Chapters 5 through 20 (less Chapter 18) - that is to say, 60% of the book - and shares equal time with Sandra in the subsequent seven chapters. Furthermore, in chapters in which Jay and Sandra are together, the viewpoint seems to be Jay's (In particular, Sandra's emotional states are much more often described in terms of how they appear to him, whereas his are described as definite states). Now, clearly the focal character does not have to have more page time than any other, but you can see how that, combined with the viewpoint being Jay's, might give that impression. Of course, there are as many ways to read a book as there are readers, so it may just be an idiosyncrasy of mine. But I hope that explanation helps you to understand where I was coming from.